I’d like to just say thanks to all the people at SIRIUS XM Radio for putting on an incredible fantasy football draft at the Hard Rock Cafe and for playing for one of our Throwback trophies. It will no doubt be an exciting year. Jacksonville Jaguars RB Maurice Jones-Drew and Gary Dell'Abate of the Howard Stern Show pose with the Throwback trophy before the start of the Sirius XM fantasy football draft. 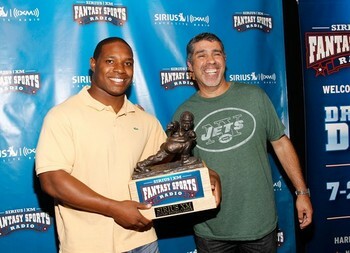 Next post: Maurice Jones-Drew may know fantasy football, but can he win the trophy?